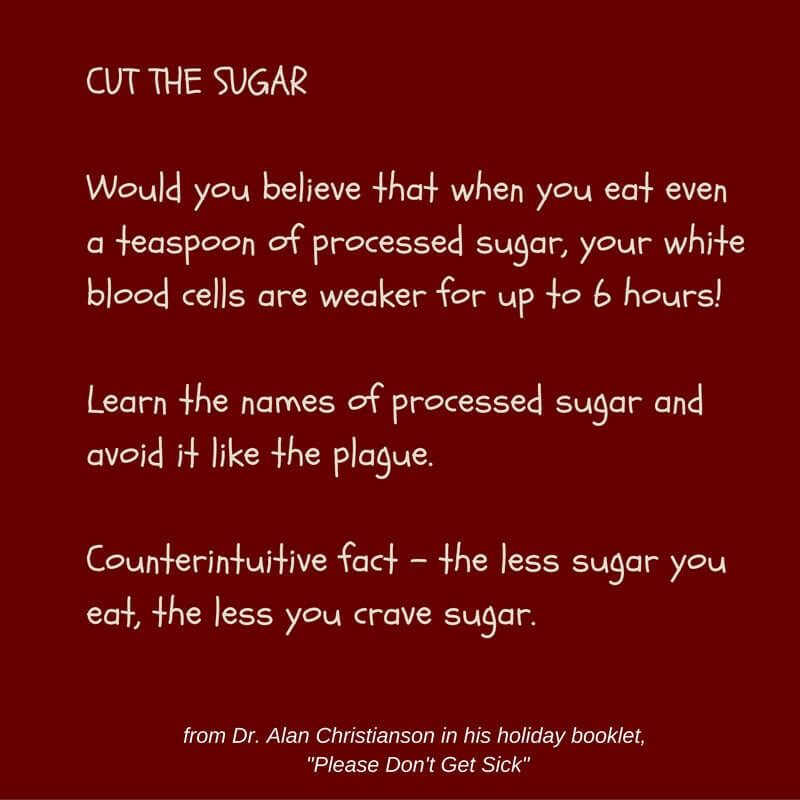 And then this came from Dr. Alan Christianson in a mailing about not getting sick during the holidays. White blood cells are part of the immune system and when they are weakened, we are more likely to come down with a cold or the flu. There’s a lot more to be said about why we should eat less sugar. I wrote a whole post on that but let’s be realistic—this is not the time for it. So let’s assume you’ll read the rationale when I post it after the holidays. Right now, I’ll tell you where I’m coming from and get to the practical stuff. Within the above parameters, here are some kitchen strategies. Read labels and don’t use anything with sugar in the first five ingredients. This may be more challenging than you think. Years ago, when my thirteen-year-old was grumbling about the lack of variety in breakfast cereals in our house, I sent him to the store with five dollars to buy whatever he wanted. The only guideline was that it could not have sugar in the first five ingredients. He came home with a long face and no new cereal. If anything, the use of sugar in processing has increased since that time. removing the salt from dessert recipes. Salt counteracts sweet flavours. With salt gone, you can get away with less sugar and still have the same effect. replacing sugar with naturally sweet fruits such as banana, applesauce or pureed pumpkin (or squash, or sweet potato). Use pretested recipes when replacing sugar with something else. Recipes for baked goods are based on consistency of ingredients, so you won’t have good luck if you replace a cup of sugar with an equal amount of honey or applesauce in your favorite cake or cookies. The liquid in the honey or applesauce will throw off the dry/liquid balance in the recipe. It’s better to let a food scientist like Catherine Katz do the experimenting unless you have a good understanding of how the elements of baked goods work together. Dried fruits are a traditional means of adding sweetness. I grew up on the Canadian prairies where dates and raisins were winter-time staples. I used to eat them by the handful for a snack. I realize now that this probably didn’t do me any long-term favours. Dates and raisins are very sweet. When eaten alone, they pack a sugar punch that probably contributed to the eventual breakdown of my sugar-coping mechanisms. Much better to have some fat, protein, and fibre at the same time. I make the recipe as directed, except I don’t like rolling them in cocoa powder. The flavours aren’t compatible, and they are messy to serve. I’ve used the mixture sandwiched between ginger shortbread cookies. Fabulous flavour combo! The amount of sugar is determined by your choice of chocolate. For less sugar, buy good chocolate with at least 70% cacao solids. 90% has even less sugar but I find it too bitter. Melt chocolate gently. Some people use the microwave. I prefer to break the chocolate into pieces, place in a small bowl, and set the bowl in a pot of water that has come to the boil and been turned off. It will melt in short order with a bit of stirring. The bark is made by pouring the melted chocolate onto a piece of parchment, spreading it as thin as you like, and sprinkling on some nuts and dried fruit. 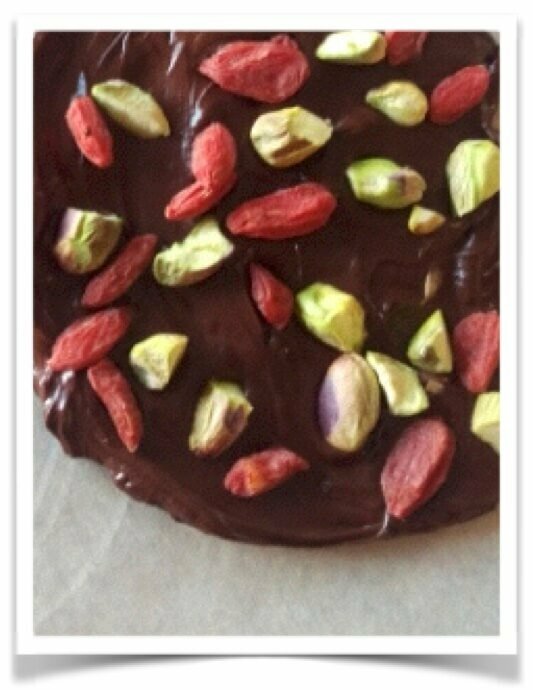 Or you can stir the nuts and fruit into the chocolate and then spread it out. I omit the coconut in the above recipe because I think it detracts from the appearance. Use your imagination and preferences to come up with combinations besides pistachios and gogi berries. What about walnuts and bits of dried apricot? Pecans and dried cranberries? Macadamia pieces stirred in, with coarse sea salt sprinkled on top. Go for it! As I mentioned previously, it took grain-free eating for me to recover my health. I was in a state of insulin resistance and all carbohydrates were a problem, not just sugar. Carbohydrates are of two types: simple (sugars of all sorts) and complex (starches including grains and their flours, potatoes, sweet potatoes, corn, beans, lentils, peas). Complex carbohydrates eventually break down to their simple sugar components. So they can be an issue for anyone whose sugar-handling system is not working properly. For me, that meant no flours from wheat, rye, barley, oats, rice, or quinoa. And no starches like tapioca or cornstarch. It also meant no gluten-free mixes, which substitute non-gluten flours and starches for the wheat flour. This took me on an adventure through Paleo websites where I learned about almond flour, almond meal, coconut flour, and chickpea flour. They have protein and fibre instead of pure starch, which works better for me. The bonus…they are not addictive in the same way wheat flour was for me, so I can eat a normal quantity of these sweets and then stop. One of my favourite recipe sources is Elana Amsterdam, who’s been at this for many years and produces reliable recipes. Here are some of her cookies that fit the holiday theme. Pecan Shortbread Cookies Keep a log of this dough in the freezer to slice and bake on short notice. I substitute maple syrup for honey or agave. Ginger Cookies I use melted coconut oil instead of palm shortening, molasses instead of yacon syrup, and maple syrup instead of agave or honey. I also cut the amount of syrup in half and found it plenty sweet. Ginger Shortbread Cookies These are the cookies that were fabulous sandwiched around the date ball mixture. I don’t bother with the melted chocolate and sprinkles, but that would be a whole other taste experience. They are also good plain. I use coconut oil instead of palm shortening, and maple syrup instead of honey. Mexican Wedding Cookies These are like balls of shortbread with pecans in them. I use coconut oil instead of palm oil, and maple syrup instead of honey. I omitted dipping them in powdered sugar and didn’t miss it at all. Raspberry Thumbprint Cookies So good! Don’t go overboard when filling the thumbprints with jam. It is also important to retain perspective on the quest for health. There are times to hold firm and times for some flexibility. I’m ruminating on this because making marshmallows at Christmas has been my tradition as long as I can remember. My mom always made them. And apparently her mom did too. 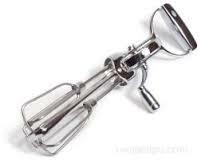 I was always intrigued by the fact that grandma only had a hand beater and still got the job done. It seemed like a testament to the strength of pioneer women. My dilemma is that marshmallows have a lot of sugar, which is the only ingredient besides gelatin and water. Will I make some this year, or abandon this tradition in the name of health? 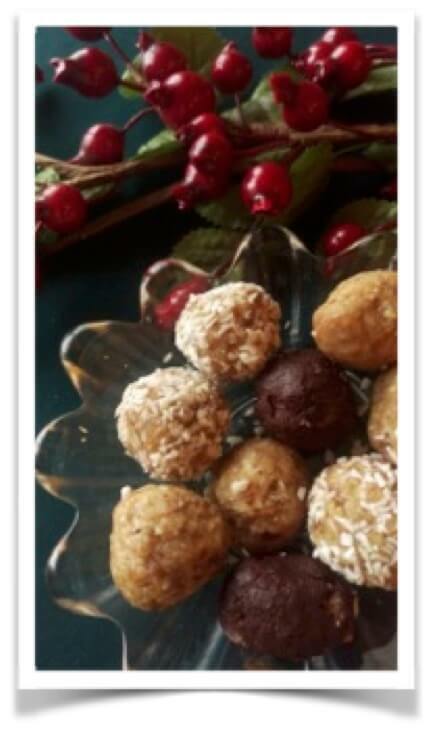 This entry was posted in Understanding the Playing Field, Information, Action & Being Resourceful, All Posts—newest first and tagged sugar, less sugar, baking, almond flour, insulin resistence, artificial sweeteners, natural sweeteners, Catherine Katz, recipe development, Elana Amsterdam, holiday baking, Dr. Alan Christianson, recipes by Laurana Rayne. Bookmark the permalink.